Consider participating in the Third Coast Atlas project. Third Coast Atlas is an unprecedented compendium of theoretical essays, maps, scholarly research and design provocations that facilitate a contemporary survey of the urbanization of the Great Lakes Basin, known as the Third Coast. This includes research, analysis and design from scholars and practitioners in the disciplines of architecture, urbanism, landscape, geography and ecology. The book [is] conceived as an atlas that positions the Great Lakes Basin as a synthetic regional territory with a population of 30 million people and investigates its landscapes as strategic events in the economic, infrastructural and ecological concerns and opportunities of the area. The publication recognizes the global significance of the Great Lakes as a crucial freshwater source by thorough documentation of the mechanisms that preserve and control the lake system as an operating hydrological resource. Mindful of rampant post-industrialization and the ongoing transformation of rust belt urbanism, the book also charts the complex relationship between urbanization, landscape and the material economies of the region. The Great Lakes is designated as one of the United State’s eleven Megaregions in the 2050 national plan. 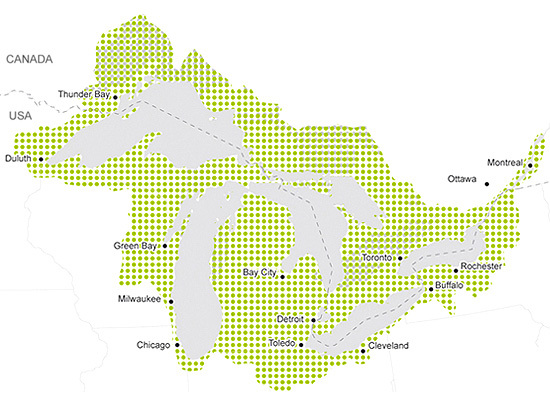 By applying a broad section of design scholarship to the research, analysis and speculation of regional territories, this publication is positioned as a reference guide for a future plan of the Great Lakes Megaregion. While specific focus is on the area called the Great Lakes Basin that forms the upper coast of the Great Lakes Megaregion, many of the issues addressed have universal appeal and are shared by many other territories worldwide. The three editors spearheading this project are Clare Lyster (University of Illinois, Chicago), Charles Waldheim (Harvard) and Mason White (Toronto; Lateral Architecture; InfaNet Lab). Submissions are due August 30, 2010. I thought the Mississippi was the 3rd coast. Your scientific and political stupidity are matched by your vapid arkitekt-talk. This sounds great. Looking forward to seeing how it develops from here.